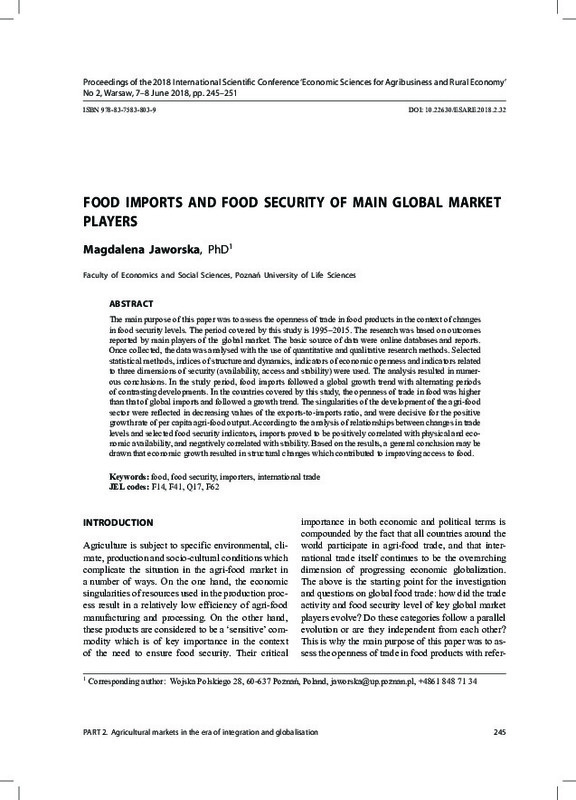 The main purpose of this paper was to assess the openness of trade in food products in the context of changes in food security levels. The period covered by this study is 1995–2015. The research was based on outcomes reported by main players of the global market. The basic source of data were online databases and reports. Once collected, the data was analysed with the use of quantitative and qualitative research methods. Selected statistical methods, indices of structure and dynamics, indicators of economic openness and indicators related to three dimensions of security (availability, access and stability) were used. The analysis resulted in numerous conclusions. In the study period, food imports followed a global growth trend with alternating periods of contrasting developments. In the countries covered by this study, the openness of trade in food was higher than that of global imports and followed a growth trend. The singularities of the development of the agri-food sector were reflected in decreasing values of the exports-to-imports ratio, and were decisive for the positive growth rate of per capita agri-food output. According to the analysis of relationships between changes in trade levels and selected food security indicators, imports proved to be positively correlated with physical and economic availability, and negatively correlated with stability. Based on the results, a general conclusion may be drawn that economic growth resulted in structural changes which contributed to improving access to food.